Midstate Manufacturing's varied and diverse abilities can be your resource for an ever expanding array of manufacturing products and services. As you browse through our site, if you do not see what you are looking for, please contact us. Our history is filled with many successful, ongoing ventures sparked by a customer inquiry on an idea or a request to manufacture their prototype. 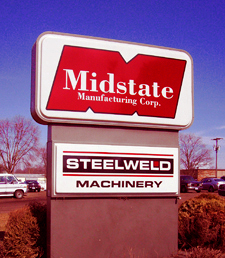 From its inception, Midstate Manufacturing's goal has been to focus on our customers. We realize without them, we would have no business. Our work force values their reputation for being the best at what they do. We feel our customers deserve nothing less. Our honesty, integrity, and professionalism has earned and kept Midstate Manufacturing's customers coming back and bringing with them new ideas and projects. At Midstate Manufacturing, we consider trust as the foundation of our business strategy. It is that relationship which has lead us to invest millions of dollars in equipment and facilities to better service our customers. Our diversification is by plan. Our Steelweld Machinery Division, CNC Machining, Engineering, Lasers, Robotics, Powder Coating, Prototyping, QC Lab, Engine Packaging, Sheet Metal, and Welding represents a broad spectrum seldom seen in a company. Today’s market place is constantly changing. We see Midstate Manufacturing's ability to react to an opportunity, to remain flexible, to continue to be dedicated to quality, to supply value, and to add content as the key components for your company’s success now and in the future. It provides security, we will be there when you need us. Much has been said about partnerships these days. Several of Midstate Manufacturing's customers are also our suppliers. We use and promote our customers' products within our own organization and products. This builds a truly two way street where both partners benefit and profit. We work together to better our businesses. Curtis Pitman - President and CEO of Midstate Manufacturing Co.